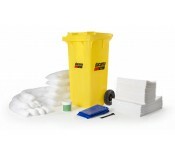 High grade oil spill kit 15 litre. Fast absorbing action, and fully prepared to deal with the ..
High grade oil spill kit 30 litre. Fast absorbing action, and fully prepared to deal with the ..
Keep your working environment clean and tidy with this great product from the Spill Excel range ..
Reduce down time and mess with easy to use absorbent socks. Quick to deploy and dispose of. Oi..
High grade chemical spill kit 15 litre. Fast absorbing action, and fully prepared to deal with..
High grade chemical spill kit 30 litre. Fast absorbing action, and fully prepared to deal with..
Reduce down time and mess with easy to use absorbent pads. Quick to deploy and dispose of. ..
Reduce down time and mess with easy to use absorbent socks. Quick to deploy and dispose of. ..
High grade oil spill kit 120 litre. Fast absorbing action, and fully prepared to deal with the..
High grade chemical spill kit 120 litre. Fast absorbing action, and fully prepared to deal with.. These absorbent granules are fire retardnat, highly absorbant wood fibre which absorbs oil, greas.. Fully sealed, moulded bund, designed to contain leaks and spills, and keep your workplace clean, .. Containment drip tray for smaller liquid storage. Ideal for general housekeeping and spill con..